Xavier Institute for Gifted Children. Westchester, New York. Jean is outside, meditating. 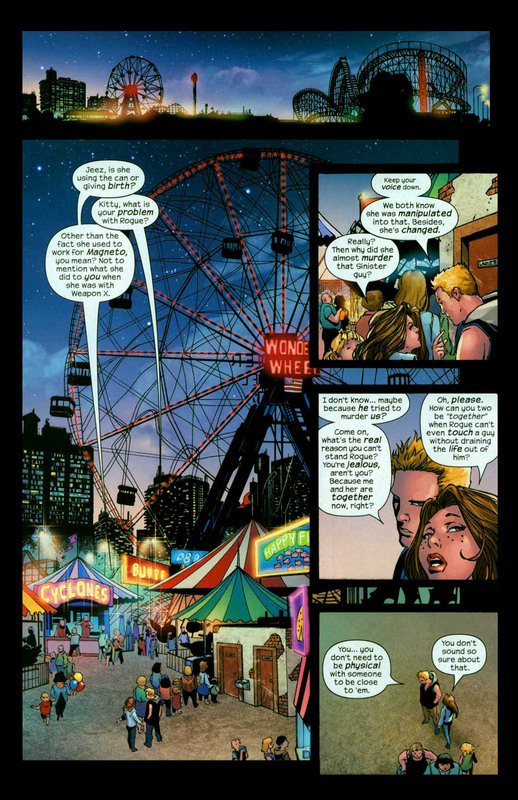 Scott shows up, his mother didn’t sign the permission slip, so he didn’t go with the rest of the X-Men to Coney Island. I guess Ultimate Scott still has his mother in his life. I’m sure Scott’s mother doesn’t sign permission to all of their foreign locations or impromptu adventures. I can imagine Xavier drawing a line at fun activities. Once a month, Jean’s telepathy starts affecting her telekinesis. Jean comments on the sunset, but Scott sees it, like everything else, red. Jean gets him to take off his glasses and blast into the sky. So he can see normally for that little bit. Could thing Xavier owns all of the property for miles on end. Coney Island. Brooklyn, New York. Colossus is trying out one of those strong man games, but it isn’t budging much. Colossus gets super frustrated, as he knows he is much stronger than the game lets on. He makes a reference to Illyana, so this is the issue that she is mentioned in Ultimate X-Men 18. That’s sort of cool that I bought both of these appearances for Christmas. Rogue and Bobby are going to go to the Spin ‘n’ Puke, and Bobby invites Kitty – which she is thrilled to be a third wheel. Storm and Wolverine are going to roam about. Dazzler is left behind with Colossus, she doesn’t like being called, Dazzler. That is her band name, her name is Ali – I will try to remember that. Ali, like Beast, suspects that Xavier messed with her mind to make her join the team. Ali keeps coming on super strong and Colossus isn’t making a move. 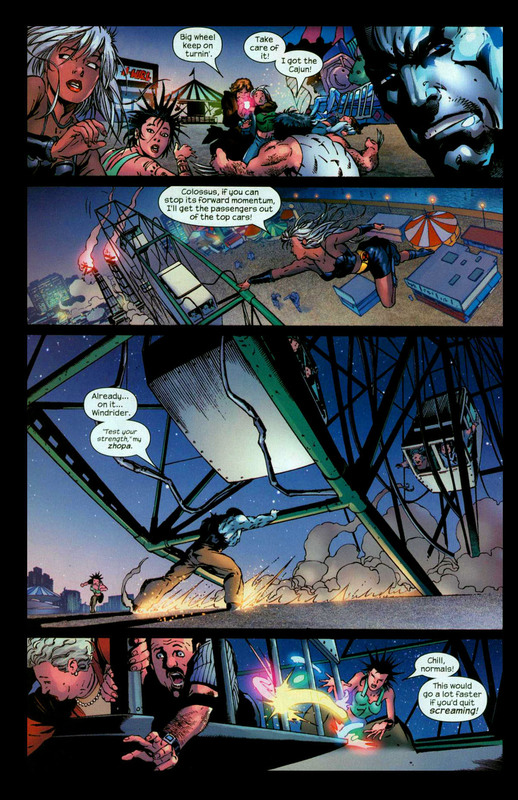 Storm and Wolverine come across the ‘freak show’ tent which upsets Storm. We get the first appearances of Ultimate Wolfsbane, Puck and Great Lakes Avengers’ Big Bertha, as well as Spiral. Wolverine tries to calm her down. We start seeing that Gambit is stalking various members of the team. Storm feels back for Nightcrawler and Angel, as their mutations means that they can’t be out in the public. We see that Nightcrawler and Angel are in a Danger Room Pirate scenario. Angel wonders if they are going to get into trouble and Nightcrawler suspects Xavier is off rehearsing a dumb speech. Turns out, Xavier is enjoying watching the session. Rogue is in the bathroom, so Kitty decides to lay into Bobby. She doesn’t like Rogue as she use to work for Magneto and when she was in Weapon X, she messed up Bobby pretty well. Bobby has since forgiven Rogue as she wasn’t in her right mind, at that time. Kitty’s third example is that Rogue nearly killed the insane Mister Sinister, Bobby says that he was trying to kill them, so that is pretty reasonable. Bobby doesn’t like it that Kitty references how a guy can’t really be dating a girl he can’t touch. Bobby wants her to stop. Kitty wants him to admit that he is only dating Rogue so that he can avoid being in a real relationship. Bobby kisses Kitty and she’s been desperate to be in a relationship, so she kisses him back. Rogue witnesses this. Rogue makes her way over to her boyfriend and straight punches out that hussy, Ms. Pryde! She will spend the rest of the issue knocked out. Gambit asks if there is anything wrong here. oh, Gambit, does anyone look good with a perm? I haven’t seen any evidence to prove otherwise. Bobby turns into Iceman and Gambit takes him out. The other four X-Men hear the ruckus and come over. 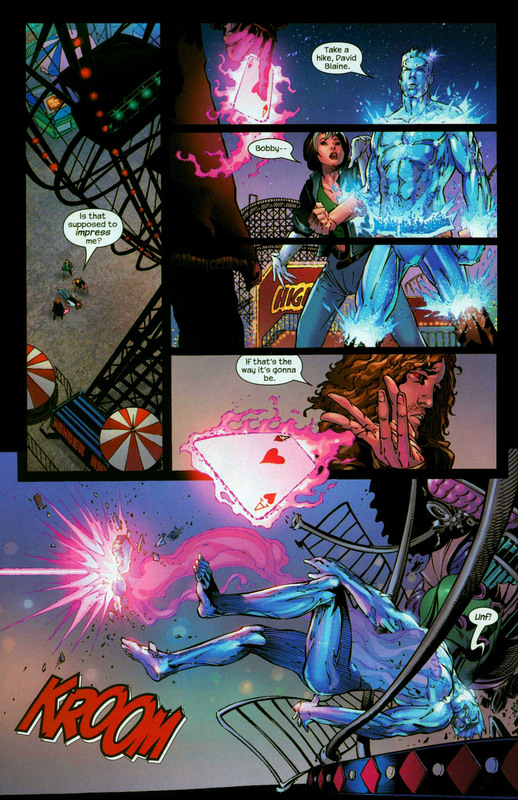 Gambit has been training and can now make killer shots and brings down an entire Ferris wheel, with one card. 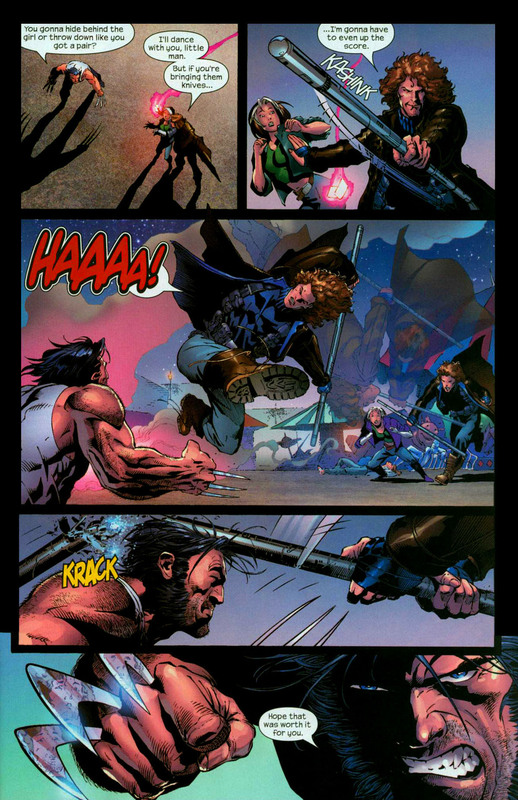 Wolverine gives some orders and he takes on Gambit. Wolverine pops his claws and Gambit brings out out his bo staff. 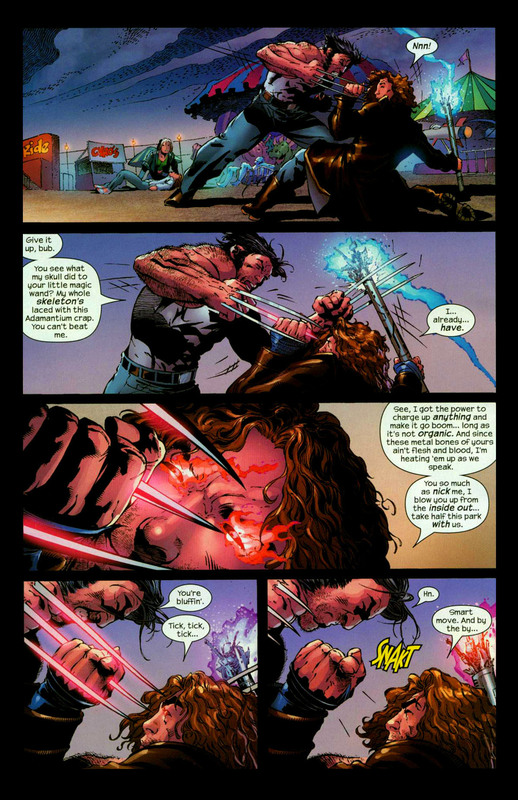 He breaks it over Wolverine’s head. Gambit grabs one of Wolverine’s claws, which must really cut up his hand, right? He starts charging Wolverine’s skeleton and Wolverine sheathes his claws as he doesn’t want to explode. Now, I really want to see Gambit do that to Wolverine, with his healing power, he can take the beating and it would be a cool thing for Gambit to do. Instead, Gambit charges his bo and places it in Logan’s mouth and explodes his skull. 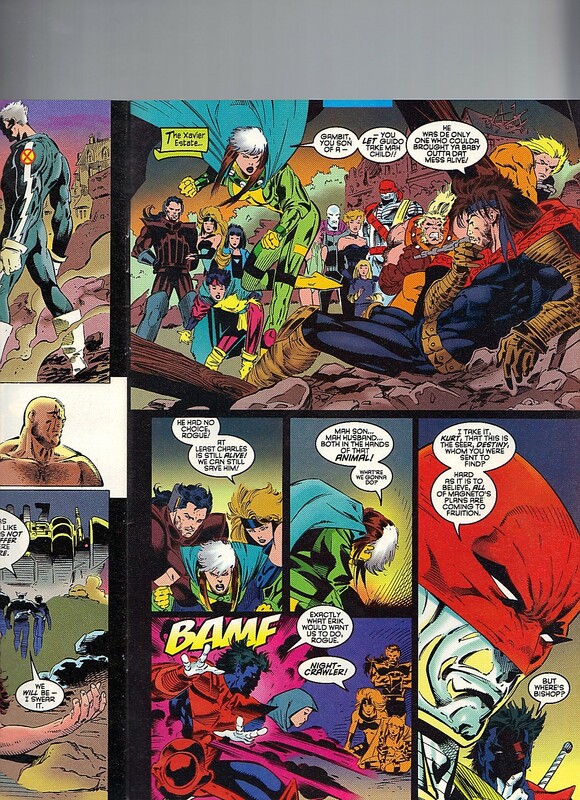 Issue ends with Gambit telling Rogue that he has been charged with stealing her away. I own the other three chapters to this storyline, so I will review those one of these days. 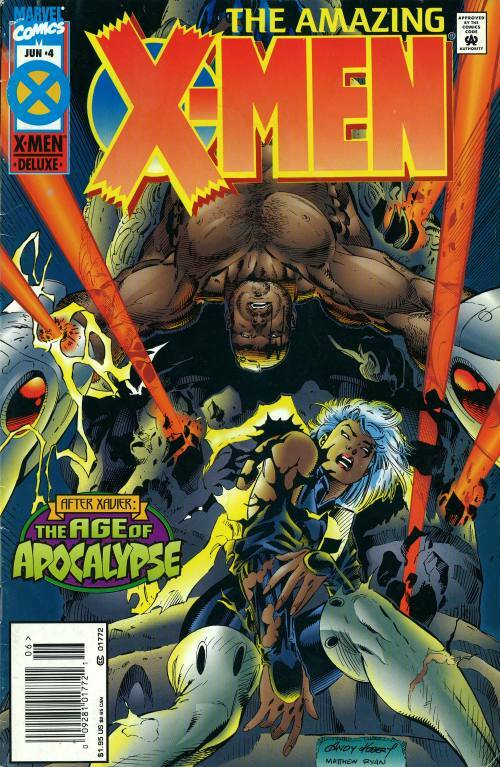 Now, this is the only other issue of Age of Apocalypse, besides the final issue – Omega. This issue was pretty confusing but maybe I’ll be able to follow this one better. The issue opens with the Madri torturing Bishop, as he may ruin all of Apocalypse’s schemes. Shadow King was able to see Bishop’s memories of the proper timeline. Bishop has been tortured for two days now. Does Bishop ever comment on his memories of this timeline? I imagine he could work it into many conversations. But he also doesn’t talk about his childhood of the future either. Storm drops from the sky, here to save Bishop. With a gust wind, the Madri are thrown back. This gives Storm the time she needs to use her lockpicks to unlock Bishop. Bishop is surprised to see them and Storm asks if his Storm doesn’t have these skills and works in how she was an orphan in this timeline. Storm hints that her fellow X-Men, Quicksilver and Banshee are outside. They are trying to find the source of the Madri’s power. Banshee lets out a hypersonic signal that knocks out the first guard. Banshee states that all the cats and dogs in the ten mile area are losing their minds. With the opening of a door, they see that the Madri really are . . . .Jamie Madrox! Who is a bit insane, at first, I thought he was Jamie Braddock. Their mission is to kill him but he looks insane, due to spreading himself so thin. The Remains of the Xavier Estate. We find the Astonishing X-Men (so I’m not sure besides the above three, who makes up the Amazing roster). The Astonishing X-Men are Sabretooth, Blink and Morph (both of whom I know from Exiles), Wild Child and Rogue. Iceman told them, so I guess he’s part of Amazing?, that Bishop and Magneto were captured. Rogue is worried that both her husband and son are in danger. Apocalypse had personally been there to oversee the mission. Sabretooth sniffs all three Rasputins. 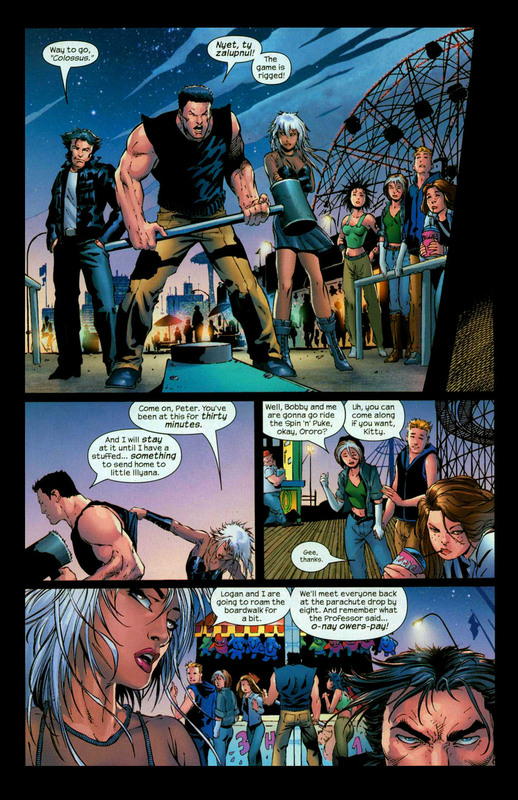 Sabretooth just says, a child, so Rogue thinks it may be her son – Charles. Colossus pipes up that the child is his sister. They were successful with their mission. Colossus hints at the horrible price as Shadowcat stands at a distance, not pleased. Rogue is sad to hear about the deaths of Generation Next. No hint that Colossus allowed them to all to die, so that his sister may live. Blink is shock, as she should have been on that team. Which is the opposite of what happened to her in the Proper Marvel Universe, where the Pre-Generation X team (with Jubilee) was on a fateful first mission and Blink had died during. Rogue goes to comfort Shadowcat , who I do like how she goes by Kate in this timeline. She didn’t have the proper childhood that allowed a silly pet name, like Kitty. Kate tells Rogue that she has no tears left to cry. Kate also says that the estate was empty when they arrived. Exodus and Dazzler (possible other Amazing cast members?) are in the tunnels looking for Charles. Kate further tells the team that Quicksilver went to Quebec. 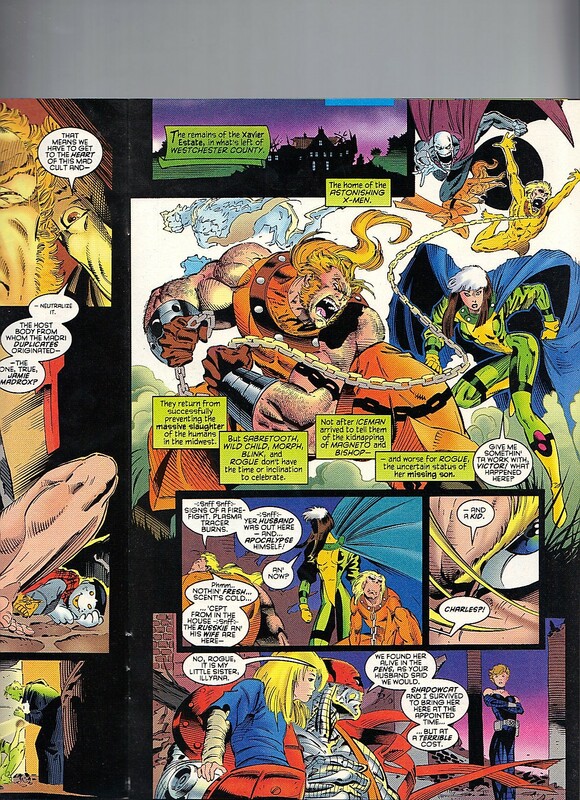 Rogue tells Sabretooth that he is with her. Rogue, Sabretooth and Wild Child are now in the Tunnels, I can only imagine these are the Morlock Tunnels. They come across Dazzler and Exodus. With them are Gambit and Jubilee, I believe. Gambit knows where Charles is. Rogue is punching Gambit (which is a fun sight) as he had to let Charles go. Quebec. Storm and Bishop are quickly losing ground, they need support. Elsewhere. Quicksilver and Banshee don’t know what to do; meanwhile, Madrox is begging them to kill him. Once he is dead, the Madri will fade away. Quicksilver is conflicted but Banshee is all for killing him, as it is war time. Before they can make a decision, Abyss arrives to taunt them. Quicksilver has defeated Abyss before. Abyss doesn’t allow that to phase him, as he jokes that Bishop and the woman that Quicksilver loves (Storm) are in dire straits. I guess it is a secret that he has feelings for her as Quicksilver is surprised Abyss knows that. Abyss calls Banshee a coward and this unleashes Banshee, I really dig his costume redesign, he should wear that outfit again. Banshee tells Quicksilver to grab Madrox and save Bishop & Storm. Banshee is willing to die, if he takes Abyss with him. Banshee enters Abyss’ body and causes him to explode from within. This reminds me of how you defeat Abyss in X-Men Legends II. Thanks to YouTuber ShadowMokujin for hosting this video. Quicksilver makes it out, but he is sad as a man he thought of as a brother, has just died like the hero that he is. Madrox still wants to be killed. If Madrox dies, Storm & Bishop will no longer be in danger. Storm is loved and Bishop is needed so Madrox allows himself to die – though I’m not sure how. Minutes Later. Storm cries over the deaths, more sacrifices being made to stop Apocalypse. Quicksilver hugs and comforts her. Xavier Estate. 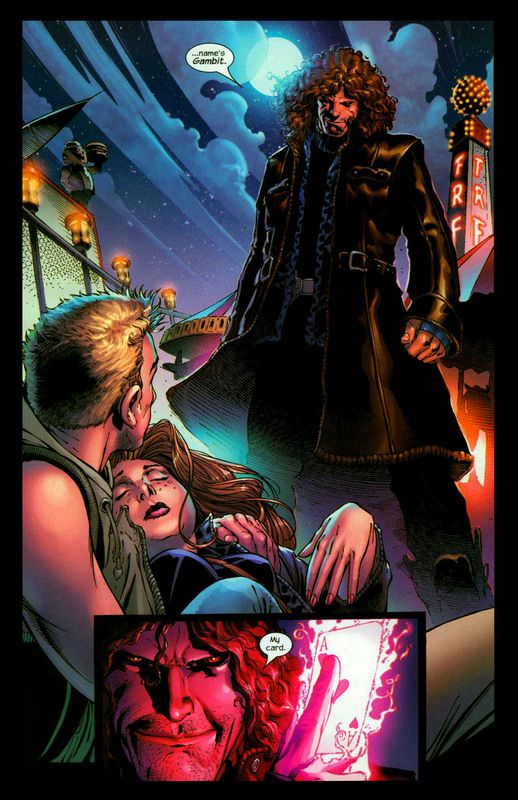 Gambit has confessed that Strong Man took Charles. Guido took him, as he was the best chance of Charles escaping peacefully. So “took” isn’t the right word. From Rogue’s reaction, I take it he isn’t an ally so it must still be a bad decision. I like how this issue is the pay off of both Generation Next and X-Calibre, as we learn that Generation Next was successful in their mission of saving Illyana and we learn that X-Calibre (Kurt’s team) was successful in saving Destiny. I doubt Gambit’s series (X-Ternals) was about saving Charles but maybe it was but it doesn’t feel like a conclusion. A ship lands and Quicksilver, Storm and Bishop come out. I like seeing Rogue and Quicksilver having a moment. Sabretooth states that Gambit was the only one who failed their mission. Issue ends with Quicksilver stating what they have to do. Get the piece of the M’Kraan Crystal (that Gambit failed to do) and save his father and brother (took me a second to realize he’s talking about Charles). This will all conclude in X-Men Omega, that we will get to but we have one more stop to make. Before this issue, I own issue 28 and after this, I own issue 77 – but there is very little continuity involved here besides who is alive and who is dead, to worry about. I wish there were more successful mutant marriages. Right now there is only Captain Britain and Meggan’s as well as Northstar and Kyle’s. One of these years, I will be reviewing Astonishing X-Men 51. From my list that I’m working off of, it should be four years from now. Hopefully I’m still doing this then. I would like to be still doing this by then. The very first thing we see if a letter from Wolverine, the next page, we see that Jean is reading the letter. I’m not sure if Kubert just draws the border of the letter and then Oakley actually writes the words of the letter but I’m pretty sure that is not the handwriting of Wolverine. Maybe of James Howlett but not Logan. Jean is being dressed by her mother, Elaine, Storm and in the background, Rachel. Rachel looks so mad in the very first panel but then we see her mood lightens as Jean’s mother, her grandmother, keeps trying to get her daughter to stand still. Elaine tells Jean that she is one in a million and she has the genetics to back her statement up. Which is super awkward as there was a clone of her daughter running around and even marrying the man that Jean is about to marry in only a few hours. But maybe Elaine wasn’t told that. That thought must cross Scott’s mind at least sometime later that night or the next day, he is marrying the original genetic source of his first wife. Or however that should be said. Or maybe it should never be said, nor written. Jean has a nice moment when she tells Rachel that if one of the successful events that comes from this wedding / marriage, is that they have a daughter, then Jean is doubly blessed this day. Rachel is so happy to hear this. Which is amazing as the bridesmaid dresses look atrocious. I really like how Jean tells Rachel this in clear earshot of Elaine, so poor Elaine has had to probably accept this time travel / alternate history nonsense and has just accepted it. She will later, years later, regret Rachel’s existence in the Grey’s End storyline, but let’s keep this a happy review. For shame! Rachel gets to call Jean, mom, and the way it is lettered, you can feel how nervous and happy she says it, how she finally got to say it. We cut to Scott and his closest friends. Which I like that his closest friends is his best man – his brother, Alex. Then his other friends are the other male members of the Original Five – Beast, Iceman and Archangel. Iceman keeps giving him a hard time about this being the last day of his free life. Typical bachelor stuff. Beast and Archangel are having the hardest time with doing Scott’s bow tie. Then Xavier shows up and does the tie for him. Xavier ends his little speech with the question if the team even needs him around anymore, as his original students are now adults and getting married. I suppose the analogy is the tie between the past and the present? It isn’t very clear. I’m surprised with how much this issue now is from Xavier’s preservative and he takes over the narration for the rest of the issue. Maybe it is to put us in the eyes of a guest as Jean and Scott’s thoughts are not going to be anything out of the ordinary. The men head out as they don’t want Jean beating them to the alter. We get a nice moment where Xavier moves from his awesome 90s Shi’ar chair to a more traditional wheelchair. He can’t have people knowing that he is a mutant. Which is odd that he kept that secret for as long as he did. Also odd that with Archangel and Beast present, as well as Nightcrawler, that is three blue mutants walking around. How many guests could either Jean and Scott possibly invited that don’t know that they are mutants or the secret of the Xavier Mansion? As Xavier is changing wheelchairs, he drops a letter from Wolverine that Rachel helps pick up for him. So weird how the creative team made a huge point to not show Wolverine at all. They even later go out of their way to not show him that makes for an awkward moment. 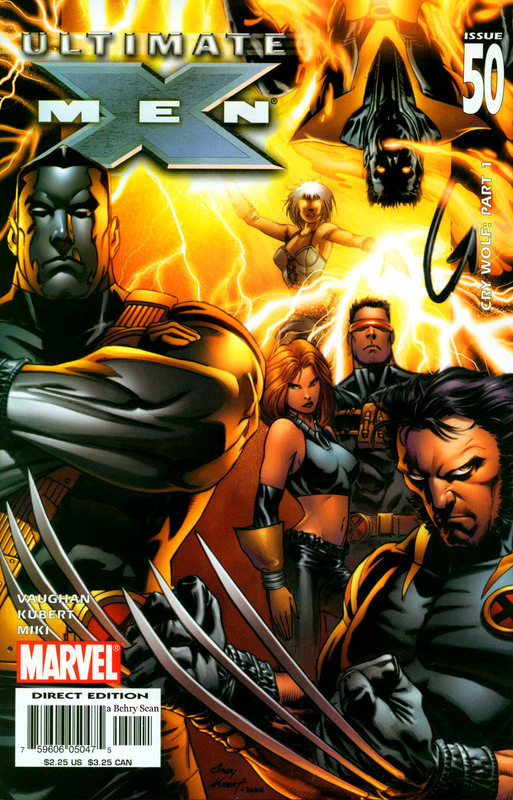 Xavier sees humans and mutants united to take part in a joyous moment, one of the rare times he can see his dream realized. All mutants have to do is make five friends and have those friends make five friends and the world will be a better place. See the Excalibur row? 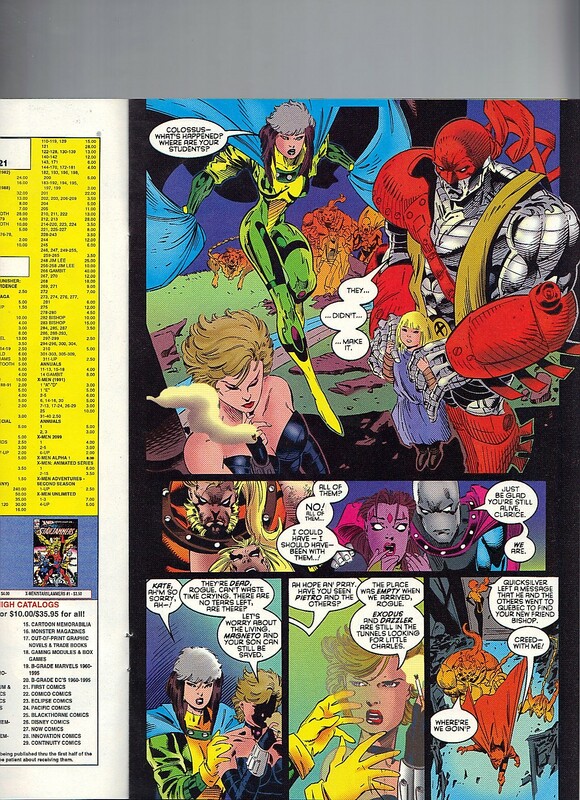 From left to right – Captain Britain, Meggan (wearing glasses? ), Nightcrawler, Kitty Pryde (with a very interesting hairstyle) and Rachel, as she takes her seat. This is the only time we see Kitty, we know from What If 60 and the Wedding Album, that Kitty is present – though her hairstyle changes as the day goes. This is the only time we see her this issue. Scott is getting nervous as he is waiting for Jean’s appearance. I know that’s how I got as my lovely bride as a little late. My nervous bladder was doing flips! 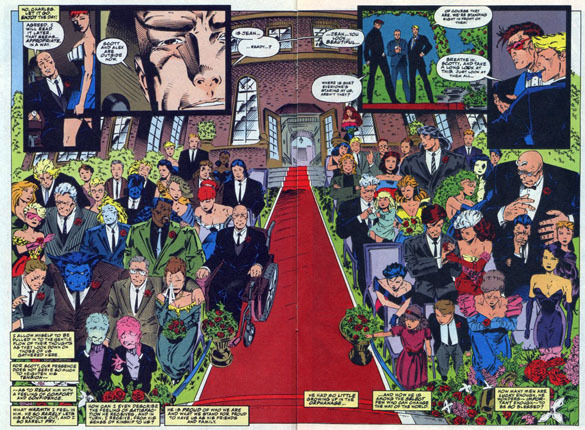 Kitty didn’t go to Quicksilver and Crystal’s wedding, so I don’t own that issue but I did leave them off from my mutant marriages. 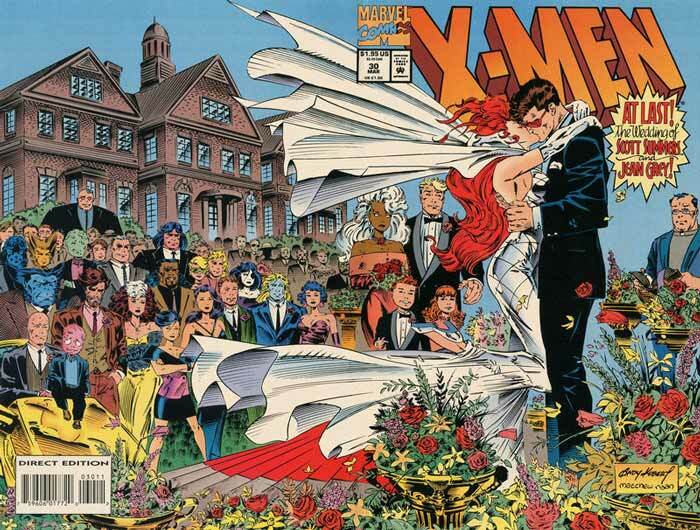 I like how Cable showed up, even though Cyclops is marrying the woman who his own mother was the clone of. The Summers family is one crazy place! Then the bridal party comes out. Storm is the maid of honor. Earlier, Bobby commented that it is January in Westchester and there isn’t a cloud in sight – that is due to Storm making it so. This is where we learn that Scott and Jean got married in January – I wish we were given the day of the week. They are X-Men, so it isn’t like this wedding had to be on the weekend, they don’t have jobs or anything like that to work their day around. Storm motions to Lila Cheney, who she and her band are providing the music for the wedding and reception. That is quite the get! Then Jean and her father walk down the aisle. Dr. John Grey hands his daughter off to her soon to be husband. The couple exchanges their vows that they made up themselves. We only get snippets of each and not sure which comes from whom. There are three Fleer cards celebrating the wedding but they make it super awkward to read these two pages. I’m not sure which religion or preference it is that does the whole tie their hands together for the ceremony, I’ve never seen it done. I’ve been to a lovely Hispanic wedding where they did it with much larger loops that went around their bodies with a small loop connecting them. That’s the closest I’ve seen. Then they kiss and we now have Scott and Jean Grey-Summers! Jubilee is the first to start hollering and Xavier is the first to start the applause. Lila Cheney, plays as the first dance song, which is U2’s One. Which I’m not the biggest U2 fan, I mostly only like Beautiful Day, and that is largely due to how the WWE used it for HHH’s return package video for when he returned in January 2002, in time to win the Royal Rumble. Which is my favorite WWE PPV annual event. I swear from 1999 to 2006, my WWE years, Steve Johnston, the music developer, made me buy or download every song they used to either promote PPVs or individual wrestlers. It just makes sense, to combine wrestling footage with songs, as that is what action movies have been doing with scores, for decades. Jean dances with her father as her mother forces Scott to dance with her. I danced with my own mother when my father-in-law danced with my wife. That seems to be the thing to do. Poor Scott’s mother is dead and only his grandparents were able to make it. The Starjammers were off in space but Corsair sent his well wishes. Imagine dancing with Hepzibah in front of everyone? I imagine Jean wouldn’t have liked that. meow! We take a small break to see Sabretooth in the snow outside of the celebration. He has special metal gloves on and his mouth has a metal plate over it. If I remember correctly, this is during the time when Sabretooth is the prisoner of the X-Men. I wonder why they didn’t just leave him in his cell? Letting him out for his walk seems pretty irresponsible. He starts commenting, aloud, that he can still cause a lot of damage even with his restraints. Then he is kicked from behind. He turns around and someone took the time to write in the snow, Don’t Even Think About It. Did Wolverine write that first, and then kick Victor? He must have, but it is so weird! Back at the wedding. Beast and Iceman are both missing their girlfriends, Trish Tilby and Opal Tanaka – respectfully. This is the section that really places the time stamp on the issue. Cable sees Val Cooper, who is currently hunting him and X-Force (I imagine) for the government. She jokes that she doesn’t see him there. Polaris is about to lose her mind on the next person who asks when she and Alex get married. Which I do own that issue that they attempt it – Uncanny X-Men 425 and 426 – written by Chuck Austen. They don’t make it down the alter but maybe I can tack it on when I don’t have any more actual weddings to cover. Something to think about considering. That’s way in August 2003, so nine years later! It is time for the tossing of the bouquet. Jean does her part and Rogue simply flies overhead and grabs it. Another instance of mutants at the wedding! Next comes the garter. Jean doesn’t want to do this. Hank told Scott that Strong Guy (Guido Carolsella) would have been upset if they didn’t. What does that mean? That he wanted a chance to look up Jean’s dress? So it is time to do it. And the guys who want to catch it are insane! We know it is Rogue who got the flowers, so how much does Cable really want to be the guy who places it on her thigh? She’s going to absorb your energy if you are not careful! As the guys fumble on top of each other, an explosion happens and Gambit is seen holding the garter. Like there was any chance of anyone else getting it. We don’t get to see Gambit placing it on Rogue. We didn’t do any of this at our wedding. My wife wanted to keep her flowers and didn’t want to lose her garter so we never got around to it and no one noticed. We did do the cash dance so our priorities were right. Then the cake in the face happens. Jean opts to not stuff it over Scott’s face. We didn’t do that either, we had small pieces prepared. There is a panel of Rachel and Cable watching their ‘parents’ dance. Cable’s father and maybe Rachel’s parents. Lila makes an announcement that the bride requests one final dance. It is for Xavier. Xavier is hesitant as he really doesn’t want Jean showing off her mutant powers. She doesn’t care, it is her day. She uses her telekinesis powers to lift and and they dance. As the issue wraps up, Scott visits Xavier in his office. Alex is going to drive the newlyweds to the airport (I guess Xavier didn’t want them using the Blackbird). This gives Alex and Scott a chance to talk about Multiple Man’s death (from the Legacy Virus) – don’t worry, it was only a dupe. That scene ends with Scott telling the closest thing he has to a father, that he loves him. aw! We also learn in this scene that his actual father sent a good luck message. Xavier looks out the window. He finally opens his letter from Wolverine, all it says is “Charles, Lighten Up. Logan” and this cracks Xavier up. He really should have read that letter first! So interesting that Wolverine bookends the comic with letters and makes no appearances. The heck! Be back here for What If Volume Two Issue 60 in two days!